1) Drink plenty of water. I know that this is obvious, but it is something that I often don't do nearly enough of-- particularly during the warm months. So this is a big reminder to me, but my guess is that there are many of you that probably are like me and forget to drink enough of it. 2) Be diligent in your use of a high SPF sunscreen (at least an SPF 30- though I use an SPF 40 most of the time). The key is to remember to reapply sunscreen frequently. I often find myself applying my sunscreen in the morning and then forgetting to do so again throughout the day. 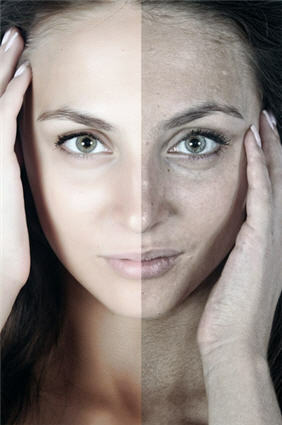 That first and only application offers us a false sense of sun protection, but it does not last from morning until night. I have forced myself to carry sunscreen with me to reapply it, but of course this means that I need to reapply some foundation, tinted moisturizer, blush, or whatever I am wearing on my face that day. While this isn't terribly convenient it is necessary, and definitely worth the trouble. It should be applied to all exposed areas, and remember that the harmful rays also penetrate your clothing. Vulnerable areas like the ears, back of the neck, the drivers side of your face and body, the back of the hands, and feet are most often neglected. 4) Exfoliate Skin once a week to remove dead skin and to ensure that your skincare is penetrating deeply enough. Of course this should be avoided if you have sunburned skin, but if your skin isn't traumatized by the elements and can handle a gentle exfoliation then this will go a long way to allowing your products to penetrate more deeply. If you see any weird looking moles that have been changing shape and size- then avoid this step and go to your doctor to have it looked at. I can't underscore the importance of this enough- it is very easy for them to identify precancerous and cancerous lesions that you want to deal with immediately. I have had numerous suspicious looking things removed that could eventually become skin cancer. 8) If you have a beloved medium to full coverage foundation that is a perfect match for you, but is too heavy for the season, then blend a small amount with your favorite facial lotion or cream, and you will have the perfect tinted moisturizer. Add a touch of primer and sunscreen, and then you have a BB Cream. When I do this I use the back of my hand to mix it- it's a fast and convenient method. I also love to add a pump of Burberry Glow Luminous Fluid Base (which by the way is back in stock at Nordstrom online!) for a gorgeous luminous glow. 9) Use a good moisture mask at least once a week, or as needed. I discovered The Organic Pharmacy Collagen Boost Mask (review forthcoming) that is my new secret weapon for glowing summer skin. According to The Organic Pharmacy, "More an instant boost than a mask, this Aloe and Seaweed gel is packed full of potent antioxidants to instantly lift, tighten and brighten the complexion. Use at least twice a week or daily during summer months." I have been using this potent antioxidant daily and am thrilled by the results. 12) A good pair of sunglasses won't just protect your eyes, but will also protect the vulnerable under eye area. Repeated sun exposure offers an express invitation for a whole flock of crow's feet to take up permanent residence on your face-- so un-invite them! This sounds good. I feel like my face is not radiant anymore and I will try your suggestions! Thanks for sharing! Sunscreen is a definite must-have for me. I've been diligent in applying and haven't been sunburned yet, which is a first for me. Seems I get sunburned at least once each summer. The Shea Moisture coconut and hibiscus body scrubs have been saving my skin this summer! Great list. Moisturizer is an essential thing to have for me in summers. It’s best to put on lotion immediately after your bath or shower, as it will absorb better. Just a light coat in the summer is fine (unless you still have really dry skin, than apply a heavier coat). Find a lotion in a summer scent you love and you’ll start each day with a smile.